Pretty much have my 3 T-Jet entry's ready to go . Next .... is getting the KC car ready. Still hoping to make it into the shark pool for the 4GO. Was wondering if this body might be legal for the 4GO competition? Not familiar with the meaning of "DoorSlammer" . A Doorslammer is basically a Pro Mod. That body would be considered a Doorslammer and therefore legal. The Winter Nationals is slowly creeping up on us.....just like races do . First week of March has come and gone. Roughly two tuning weeks left. Cars need to be here before Thursday March 28. I as Racemaster will not be running any cars in the Class racing, but will have cars in the Kiwi Challenge and The List races. Track preparations are ongoing consisting of painting, resodding in some areas, filling post holes left by the gantry's, and new starting line design and color. 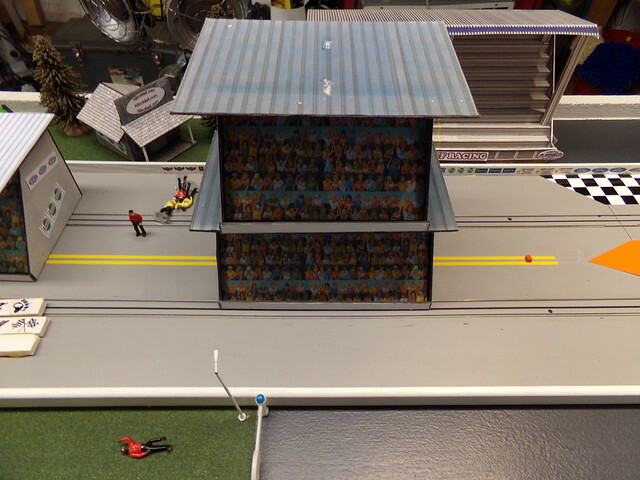 Some of the older grandstands are getting new tin roofs and signage is being updated as well. I am still trying to get a race poster up, but have not had time to work on it. All the race info. is on Page one. Looking forward to this one. It is turning into a good one! I just got word that there are going to be (8) Kiwi cars and (1) UK car on Team NZ. We currently have (9) Team US cars now, so the teams are set. Thanks to everyone that built cars for the Challenge....both NZ and US. It promises to be another epic battle. I also need to make a correction. I initially said that NZ was up 2 to 1 on the US, but that was incorrect. The record standS at NZ two wins and one tie. The US has yet to win a Challenge. The first meeting ended in a tie and NZ has taken the last two in a row. They have all come down to the last race. NZ comes to play hard ball. Team US better be ready! 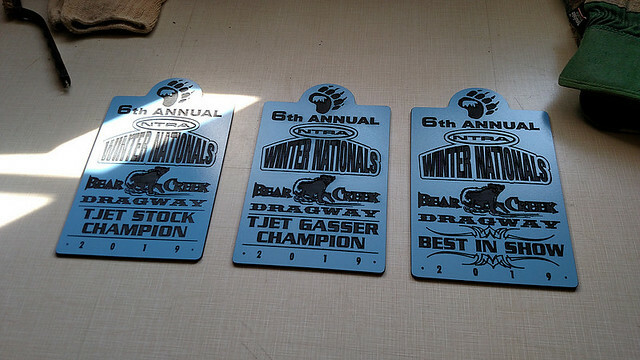 As a little added incentive, GST has been gracious enough to design some trophies plaques that will return with the winning Team. Thank you Gale!! There might also be another surprise for the winning Team, but I will make that announcement when I know something for sure. GTS also designed these that will go to the Class winners and a Best in Show! These are awesome!! This race is a non sponsored event and I wanted to do something different. So I ask Gale if he would consider doing something. He was more than happy to. All I did was give him the info I wanted and pick a couple of colors I wanted him to try and use. He took the ball and ran with the designs and layout. These are SICK! Thank you again Gale! OK......there you have it! Things are falling into place as the clock continues to tick down. If you are in the race then I look forward to getting your cars and good luck! If you are not signed up, there is still time. 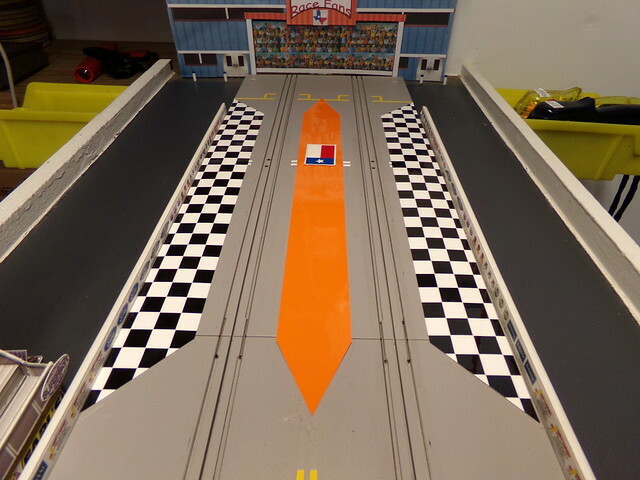 Get some cars built and see what the proxy drag racing scene is all about! Gale I have added you in the 4GO "Shark Pool" with Mazda. Might be a different body but with time elements involved, it's good to know the wagon body will work. I have just completed my first 4gear build using one of the bodies that I have received as a previous race gift. I am still a rookie so there is a lot to learn yet. My cars will be on there way over on Monday. I am also enclosing some goodies from England for the other racers. Are Dash, AW ultra G, (without traction magnet in stock), & AW/JL Thunder Jet chassis allowed in all T jet classes since they are very similar? This is not covered in our basic rules. For this event all Tjet style chassis are allowed in both Classes. At the lower voltage in Stock I don't think the Dash type magnets, etc will be much of an advantage....if any at all. It's a non issue in Gasser. Thanks for the question. New track colors going down for the Winter Nationals. Patterns are just laid in place here. 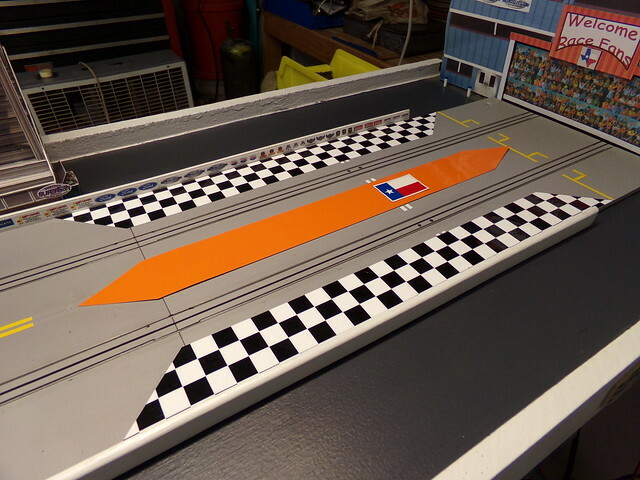 1/8" blue striping will be the border. 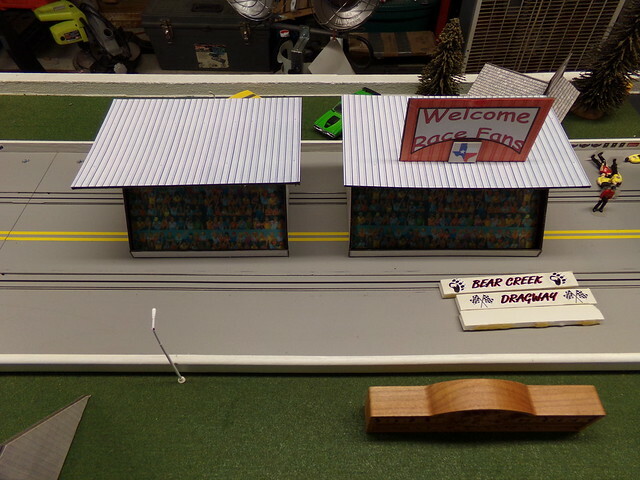 Grandstands with new tin roofs and one that still needs to be done. Start line barriers are getting upgraded too. Wow Jeff..looks like some of your track crew are exhausted from the work load! Bill, I am having the same problem, wheelie bars are a must and rims/wheels must be true. Jeff track looks great, I just purchased some red deco for my track, a track crossover, some white striping and I notice your crew passed out!!! Thanks. I've been working the crew pretty hard. Some of them can't even stand up on their own. I'm giving them a few days off.